The development of new means of activating molecules and bonds for chemical reactions is a fundamental objective for chemists. In this regard, visible-light photoredox catalysis has emerged as a powerful technique for chemoselective activation of chemical bonds under mild reaction conditions. Here, we report a visible-light-mediated photocatalytic alcohol activation, which we use to convert alcohols to the corresponding bromides and iodides in good yields, with exceptional functional group tolerance. In this fundamentally useful reaction, the design and operation of the process is simple, the reaction is highly efficient, and the formation of stoichiometric waste products is minimized. The team employed a ruthenium (II) complex to absorb visible light to form an excited ruthenium (II) complex. 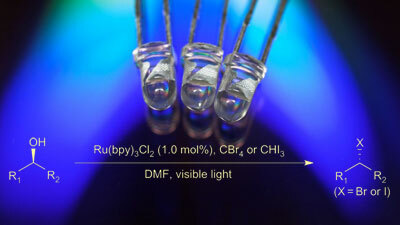 This ‘excited state’ catalyst acts as a reducing agent by giving up an electron to CBr4 to form a ruthenium (III) complex which the team observed by fluorescence quenching experiments. New monocyclic monoterpenoid glycoside from Mentha haplocalyx Briq. new monocyclic monoterpenoid glycosides, rel-(1R,2S,3R,4R) p-menthane-1,2,3-triol 3-O-β-D-glucopyranoside (1) were isolated from aqueous acetone extract of the aerial parts of Mentha haplocalyx Briq.. Compound 1 was obtained as a pale amorphous powder. Its HR-ESI-MS displayed quasi-molecular-ion peak [M + Na]+ at m/z 373.1521 ([C16H30O8Na]+), and the EI-MS gave fragment-ion peaks at m/z 171 [M + 1–162(glucosyl)-H2O]+ and 153 [M + 1–162(glucosyl)-2H2O]+ corresponding to a molecular formula C16H30O8, with the presence of 16 carbon signals in the 13C-NMR spectrum. Moreover, 1H-1H COSY correlations were observed between H-C(9)/H-C(8)/H-C(10), H-C(8)/H-C(4), and H-C(6)/H-C(5)/H-C(4)/H-C(3)/H-C(2), that the deduced spin system implied that the three OH-groups were located at C(1), C(2) and C(3) in 1, respectively. In addition, one glucopyranosyl unit δ (H) 4.33 (1H, dJ = 8.2 Hz, H-(1′)), δ(C) 105.9 (C-1′)] was evident from 1H- and 13C-NMR of 1. The J value (8.2 Hz) of the anomeric proton concluded the β-configuration of the glucose moiety, suggesting that 1 was a p-menthane-1,2,3-triol glycoside. This was further confirmed by the HMBC experiment, in which correlations of the glucosyl H-1′ (δ 4.33) with the C(3) (δ 81.9) were observed. Furthermore, other HMBC correlations confirmed the structure of compound 1. Thus, these 2D-NMR methods deduced compound 1 as p-menthane-1,2,3-triol 2-Oβ-D- glucopyranoside. The coupling constants of 10.8 Hz for H-C(3)/H-C(2), 9.2 Hz for H-C(3)/H-C(4) for 1 showed that H-C(2), H-C(3) and H-C(4) were axial protons. The relative configuration at C(1) was determined from ROESY correlation of δ 1.21 (Me(7)) with H-2 (δ 3.33). It was in good agreement with those of rel-(1R,2S,3R,4R,6S) p-menthane-1,2,3,6-tetrol . Therefore 1 should possess rel-(1R,2S,3R,4R)-configuration. Isatin, an extract from Strobilanthes cusia (Nees) Kuntze, was the base for synthesizing derivatives that were screened for antibacterial activity against oilfield water-borne bacteria. The bacterial groups are sulfate reducing, iron and total. The derivatives were characterized by spectrums and they showed good to moderate activity against sulfate reducing bacteria. This review article describes design concept, synthesis, and features of fullerene derivatives having high lowest unoccupied molecular orbital (LUMO) levels to achieve high open-circuit voltage in organic thin-film photovoltaic devices. Installation of organic electron-donating groups onto fullerene and decrease of the size of the fullerene π-electron-conjugated system raise the LUMO levels, affording high-performance organic solar cells. Addition of the methano group as the smallest carbon addend to fullerene to obtain 56π-electron fullerene derivatives is likely a promising strategy for this purpose. The second reaction is the organic reduction of 1,2-diphenyl-1-propanone 2 with lithium aluminium hydride, which results in the same reaction product as above but now with preference for the erythro isomer (2a). Now a hydride anion (H-) is the nucleophile attacking from the least hindered side (imagine hydrogen entering from the paper plane). Prepare a 0.5M NaOH (20 mmol) solution in 40 mL of distilled water and prepare a 1M solution of benzaldehyde (40 mmol) in 40 mL of ethanol. Mix the two solutions throughly. Add 0.8 g (1.1 mL, 15 mmol) of acetone to the reaction mixture and stir for 30 minutes. Recover the product by suction filtration using a Buchner funnel. This procedure produced pure trans-dibenzalacetone without having to recrystallize. The two characteristic doublets of trans-dibenzalacetone had coupling constants of 16.25Hz (located at 7.7ppm) and 15.5Hz (located at 7.1ppm). These coupling constants of near 15Hz indicates that the trans product was recovered. The limiting reagent was the acetone (0.8 g, 15 mmol) and the precent yield of this reaction was 87%. An excess of benzaldehyde (1.33 equivalent) was used and the benzaldehyde was dissolved into the ethanol prior to being introduced into the reaction mixture. Mech-Dibenzalacetone is readily prepared by the crossed Aldol condensation between benzaldehyde and acetone under alkaline conditions. Acetone is a carbonyl compound that contains alpha hydrogens. Therefore, it can participate in the various condensation reactions that involve removal of an alpha hydrogen. Benzaldehyde, on the other hand, does NOT contain any alpha hydrogens. The following sequence of reactions indicates the pathway for the formation of dibenzalacetone. Because a 2:1 molar ratio of benzaldehyde is used, the reaction continues. To synthesize a Ugi aduct from Benzaldehyde, Furfuryl amine, Benzylisocyanide and BOC-GLY-OH in methanol using Ugi 4Component Reaction. A solution of Benzaldehyde (212 uL, 2.09 mmol) and Furfuryl amine (FFA) (235uL, 2.66 mmol )was prepared in methanol-d4 in a 4mL volumetric flask to form an imine overnight. The next day a solution of BOC-GLY-OH(350 mg, 1.99 mmol), andBenzylisocyanide (240uL, 1.97 mmol) made up in a 4ml volumetric flask in methanol was added to the preformed imine. The product was filtered and washed with ice cold methanol (5mL). FAB HRMS: m/z 478.2366; calcd for C27H31N3O5 (M+H).